If you are looking for a lab to do with your students that only uses a microscope and basic supplies, here is a great one. I tested it out ahead of time and got very excited at how successful it was! I have used this lab to practice microscope skills, experimental design skills, homeostasis and adaptations, or to teach leaf structure directly. 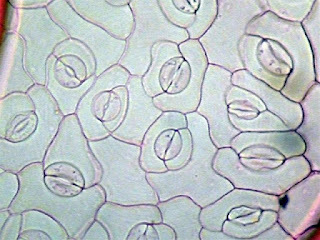 Did you know that by just using clear nail polish and tape, with almost any leaf and a microscope you can clearly see the stomata?! We teach about stomata but they always seem like an abstract concept that we can't see. Not TRUE! It is very simple to put nail polish on the back of a leaf, peel it off, and make an impression slide where you can clearly see the stomata. 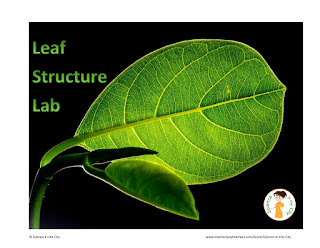 In this lab activity students read about the leaf structure and color a diagram. They also create a slide and view stomata, draw and label and answer a few summary questions about their knowledge. There is a second version included that allows students to design an experiment related to stomata. Finally, in the teacher resources guide I have included a few other links for information, and a video clip about the leaf parts. Here is a direct link to my product below.